Tech companies have tried to replace the wallet with your smartphone, but they haven’t succeeded just yet. There just isn’t a practical replacement for one of the most essential items in your EDC. That’s why instead of replacing your wallet with tech, Ekster combines the two. They already have the world's best-selling smart wallet after a wildly successful Indiegogo campaign last year, and now they’re back with the new and improved Ekster 3.0 range of wallets on Kickstarter. Technology aside, the Ekster 3.0 Parliament Wallet is still a well-made wallet that can hold up to 12 cards and cash across its main sleeve and leather bi-fold section. 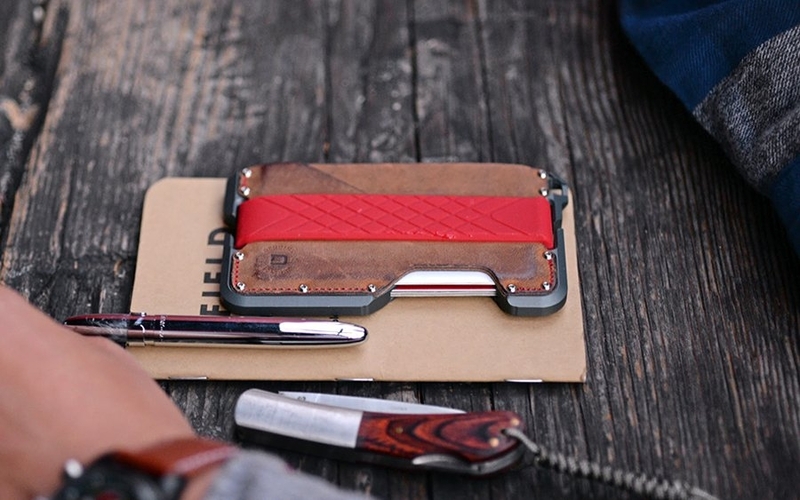 It’s wrapped in premium leather, has RFID protection, and measures only 0.4” thick. Why keep your bulky, beat-up bifold when you can get something that looks better and weighs less? Accessing your cards is also easier than before thanks to an improved trigger on the bottom that fans out your cards at the top for easy picking. For those of you who want an even slimmer wallet, there's the Senate Cardholder. It's similar to the trigger-equipped card section of the Parliament, but pared down to accommodate up to 10 cards and measure 0.3” thick. Ekster offers an even slimmer option this campaign with the debut of the Kickstarter exclusive Secretary Cardholder. It's a 0.15" thick traditional cardholder form factor designed to accommodate up to 6 cards, cash, and coins with single-side RFID protection and easy contactless payment. Ekster has partnered with tracker-company Chipolo to make one of the slimmest item trackers you can get, complete with their own patented solar panel charging tech. It doesn't require direct sunlight to recharge and holds a charge for two months. At 0.09” thick you’ll barely feel the tracker, but you'll be glad it's there if you ever need it. As the first-ever voice-activated smart wallet, you’ll be able to find your lost or stolen wallet anywhere in the world with nothing more than your voice. It's compatible with both the Google Assistant and Amazon Alexa, so asking the voice assistant to locate your phone will set the tracker ringer off and show its last location on a map. If your wallet is still nowhere to be found, Chipolo's worldwide lost & found network spans across the globe to help you find your wallet even when it’s out of Bluetooth range. When any user is within range of your lost item, you receive a GPS update of its location. Whether you’re looking to slim down your wallet or want to upgrade to something a little more modern, the Ekster 3.0 seems like a great option. Due to the success of their last campaign, the company is offering three new colors to choose from available only to Kickstarter backers. 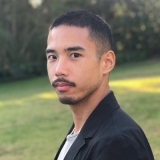 As Ekster is the only smart wallet to have made it past the crowdfunding stage (you might've even seen them at Macy's or online at Huckberry), you can back with confidence. Secure yours at the link below before the campaign ends on November 17th. This is a sponsored post presented by Ekster. Thanks to an extensive catalog covering all your card-carrying needs, Dango wallets have become a staple in many EDCer's pockets. But sometimes you need a piece of gear exactly matching your specifications—or the rest of your carry—while still preferring familiar styles and features. Dango already lets you build custom wallets, but now they offer an even more high-tech option with their newly developed DTEX material. It's a non-leather, highly durable, and water-resistant material that you can use to make the perfect rugged EDC wallet. 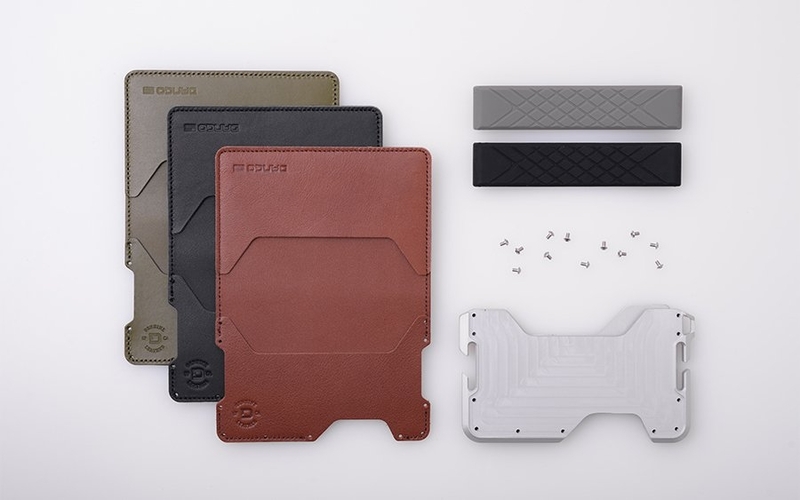 The customization process starts with Dango's CNC-machined aluminum chassis as the centerpiece of the wallet, adding structure and rigidity without much weight. From there you can take your pick of the two DTEX pockets, either a single pocket sleeve for a sleeker profile or a 3-pocket bifold to hold more of your essentials. The DTEX material itself is textured and flexible, molding itself to your use similar to leather. Bringing everything together are the wallet's band and bolts. The former comes in 7 colorways, making it either the most versatile component of the wallet's look, or a way to make the whole thing pop when choosing one of the vibrant colors. The band secures the bifold flap while giving the wallet a better grip, as well as an extra place to slot in some essentials like folded cash. Finally, the hex wallet screws are what locks the entire wallet down. The #1-72 x 1/8 steel bolts come in either black and silver, and a provided hex wrench gives you the option to change up the look of the rest of the wallet's pieces or replace them if needed. It's hard to find the perfect wallet, but with the ability to build one from the ground up with innovative materials and construction, Dango's customized bifolds come pretty darn close. Start building your own on Dango's site at the link below. Since your stash of cards and cash are such a crucial part of your day-to-day, don't you think your EDC wallet should actually protect them? We don't just mean from RFID skimmers, but things like unexpected storms, spills, drops, and everything in between. 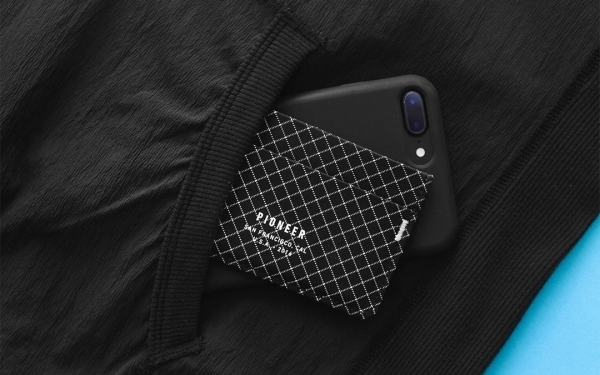 In that case, the Flipside 4 puts the “wall” in wallet thanks to a slew of rugged features in a hardshell design that keeps your cards and cash on lockdown. It's a wallet with plenty of organization, storage, and protection and very little bulk. Flipside's flagship RFID blocking wallet isn't your run-of-the-mill, ultra-slim cardholder type of EDC wallet. It's closer to a portable vault that you can slip in your pocket thanks to its structured, crush-resistant clamshell design. It's made from high-strength polycarbonate resin and aluminum to deliver scratch resistance, RFID protection, and overall durability in a lightweight frame. Despite its rigid materials, the Flipside 4 rides comfortably in the pocket due to its smooth edges and rounded corners. Pushing its ergonomic, locking front button opens the wallet like a clamshell and keeps it open, letting you easily handle its contents. Three separate slots securely grip your cards from the side, making them identifiable at a glance and quick to retrieve with your thumbs. And unlike some other wallets, you can intuitively stash 10 bills under the moneyclip in its dedicated cash compartment. The Flipside 4 wallet is made in the USA with a 2 year warranty in 6 different colors to match your EDC. Best of all, it's fairly affordable at just under $40. You can check out the Flipside 4's features and color options and grab one for your own carry at the link below. To see more of what Flipside has to offer, keep up with them on their Instagram. 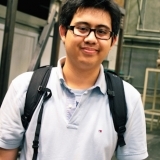 This is a sponsored post presented by Flipside. Giveaway: Win a Dango T01 Spec Ops Edition Wallet! Update: Congratulations to Steve, winner of this week's giveaway! Thanks to everyone who participated and stay tuned for more gear to win here on Everyday Carry. Who else loves free EDC gear? This week, we're hooking up one lucky reader with a cutting-edge tactical wallet brought to you by our sponsor, Dango Products. The San Francisco-based company are best known for their multi-function minimalist products, and it's your chance to win their tough T01 Spec Ops Edition Wallet. As their first non-leather wallet, it boasts a newly developed DTEX fabric and pairs it with a Cerakote-finished metal chassis for a rugged, military inspired look. Between the blend of materials and color options, it's Dango's most tactical offering yet. To replace Dango's usual go-to material of vegtan leather, they've opted for a non-leather textile dubbed DTEX. Designed with durability in mind, it's resilient yet flexible like leather but it offers much better water resistance as well as improved grip thanks to its textured finish. The Spec Ops edition wallets offer DTEX versions of both the single pocket T01 and the Bifold T01 to match your storage and organization needs. The single pocket accommodates up to 12 cards, while the three-pocket Bifold (pictured) holds 12+ cards in its more organized layout. 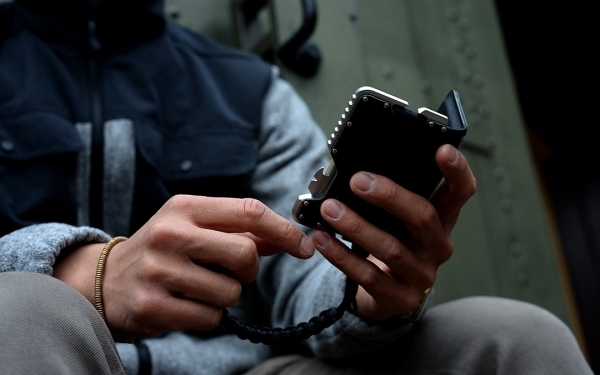 Whichever DTEX pocket option you choose, the Spec Ops Edition wallets pair it with a CNC'd aluminum chassis for structure and RFID-shielding. The metal components in the Spec Ops edition are also finished with the same durable, scratch-resistant Cerakote ceramic coating you often find on firearms. We're running the giveaway here on the site until 12:00pm ET on Tuesday, September 25th. Make sure you're logged in, and find the full details and entry requirements by clicking on the button below. Good luck everyone, and carry on! This contest is sponsored by Dango Products. 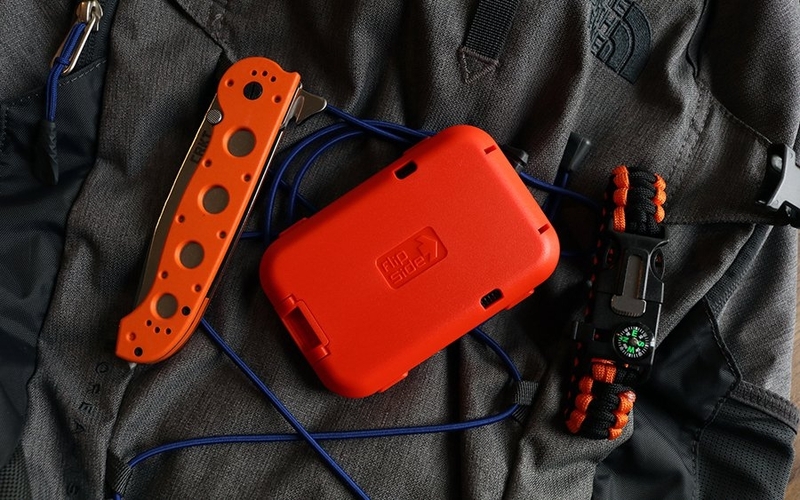 We're seeing a shift towards more high tech materials in EDC gear for tactical, outdoors, and general EDC alike. These technical fabrics often have the edge over natural materials in terms of performance, which is what you'd want for a functional EDC. While Dango's lineup of leather wallets offered utility through their designs, the newest addition does it with a material focus. As their first non-leather wallet, the T01 Spec Ops Edition boasts a newly developed DTEX fabric and pairs it with a Cerakote-finished metal chassis for a rugged, military inspired look. Between the blend of materials and color options, it's Dango's most tactical offering yet. To replace Dango's usual go-to material of vegtan leather, they've opted for a non-leather textile dubbed DTEX. Designed with durability in mind, it's resilient yet flexible like leather but it offers much better water resistance as well as improved grip thanks to its textured finish. The Spec Ops edition wallets offer DTEX versions of both the single pocket T01 and the Bifold T01 to match your storage and organization needs. The single pocket accommodates up to 12 cards, while the three-pocket Bifold (pictured) holds 12+ cards in its more organized layout. Whichever DTEX pocket option you choose, the Spec Ops Edition wallets pair it with a CNC'd aluminum chassis for structure and RFID-shielding. The metal components in the Spec Ops edition are also finished with the same durable, scratch-resistant Cerakote ceramic coating you often find on firearms. Rounding out the T01's tactical utility is the included MT02 multi-tool, which packs 14 different functions into the size of a credit card. The Spec Ops Edition T01 is available now in your choice of the single-pocket or bifold versions made from grey DTEX, paired with an OD green or desert sand Cerakote aluminum chassis. Thanks to an extensive catalog covering all your card-carrying needs, Dango wallets have become a staple in many (front!) pockets. But sometimes, you need a piece of gear exactly matching your specifications—or the rest of your carry—while still preferring familiar styles and features. 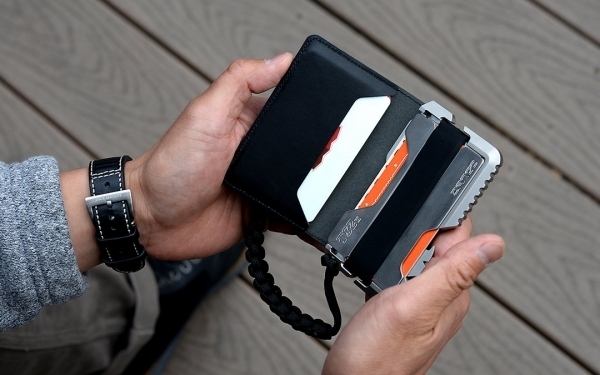 Dango hears you, and now has a new option to build your own custom bifold wallet. From pockets to leather to bands and bolts, you can build your perfect wallet, backed by Dango's long history and USA-made quality. The customization process starts with Dango's CNC-machined aluminum chassis as the centerpiece of the wallet, adding structure and rigidity without much weight. From there you can choose one of three colors (Whiskey Brown, Jet Black and Moss Green) of the 3-pocket leather piece. This component is made from genuine top grain leather, and holds up to 4 cards in each slot for a total of 12. It's hard to find the perfect wallet, but with the ability to build one from the ground up, Dango's customized bifolds come pretty darn close. Start building your own on Dango's site at the link below. When it comes to picking a great EDC wallet, it all comes down to finding the right balance for your needs. Some wallets are made of metal to keep them slim and strong, but they're not the most comfortable and can't carry cash that well. Pioneer's latest wallet, the Flyfold, takes a more balanced approach. It's a familiar bifold design, meaning it can accommodate cards and cash with ease, but made with cutting edge construction and futuristic fabrics to keep it worthy of your EDC. The Flyfold's technical fabrics and construction are what sets it apart from other wallets in its class. At the core of Pioneer's 10XD fabric are fibers 10 times stronger than steel by weight, resulting in a material that's totally waterproof, highly abrasion resistant, and uniquely grippy thanks to its densely woven nylon ripstop exterior. This material is more comfortable to carry and easier to grip than metal, yet more durable and lighter weight than leather. To match the advanced materials, Pioneer uses advanced construction methods on the Flyfold too. Lamination of the material and seams cuts significantly on bulk compared to traditional sewing methods, while bartack reinforcements at high stress points make the wallet especially robust. All this technology lets the Flyfold take on a more familiar form factor of a traditional bifold without the usual drawbacks like getting bulky or wearing out. 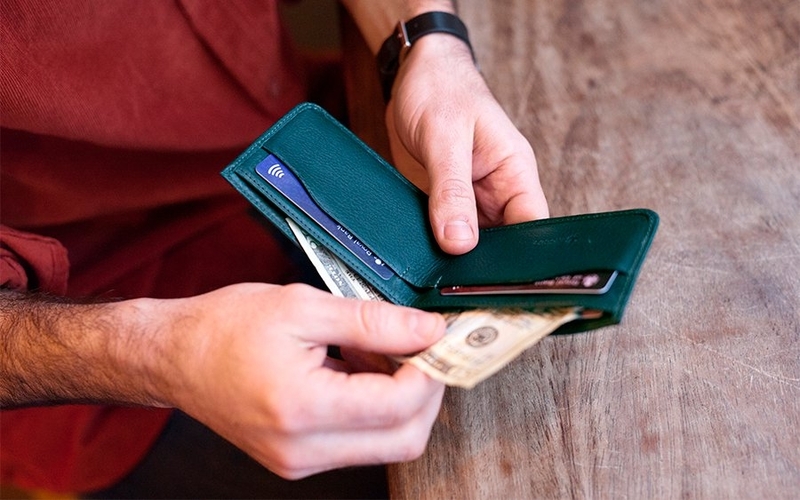 Its full-length billfold section easily fits notes with no folding necessary, making carrying cash a non-issue compared to most minimalist wallets. Two internal RFID-secure card slots are sized to hold 5 cards each (10 total) with enough space to fan the cards out for quick and easy access. 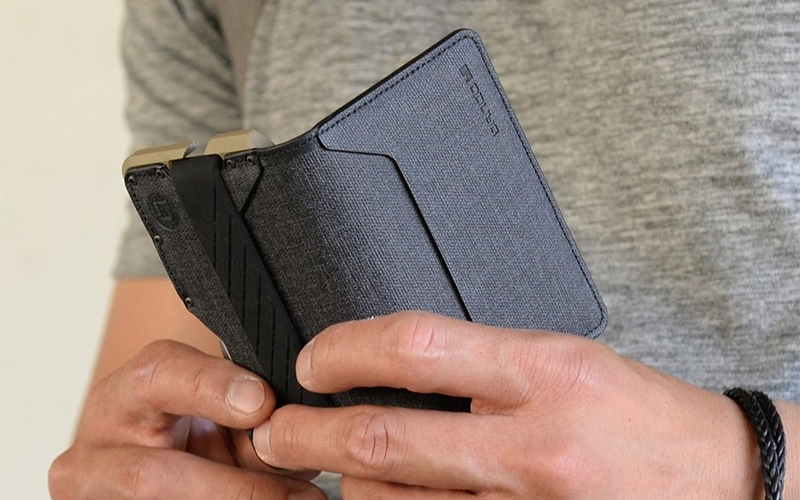 If you want a high-tech, nearly indestructible minimalist wallet that's as easy to use as your old favorite leather bifold, the Flyfold might be the one for you. Get a closer look at Pioneer's Kickstarter project at the link below and pledge before the campaign ends in about a month on October 4th. Dango has made a name for themselves by making the most of your pockets, with minimalist and multi-function wallets and organizers for every kind of EDC. There's the sleek D01 and tactical T01 if you're considering upgrading to a compact but tough wallet. You can consolidate your essentials with the P01, or keep it simple and efficient with the C01. You also have exotic carry choices with the D02 and D007. Whatever your choice, today's the day to upgrade your pockets with Dango's Labor Day sale, giving you 20% off its entire online store with code LABOR20. The sale lasts today through Monday, September 3rd, so it's your chance to pick up some great Dango gear at a discount. Shop the sale at Dango's site at the link below and be sure to pick something up before the day ends! 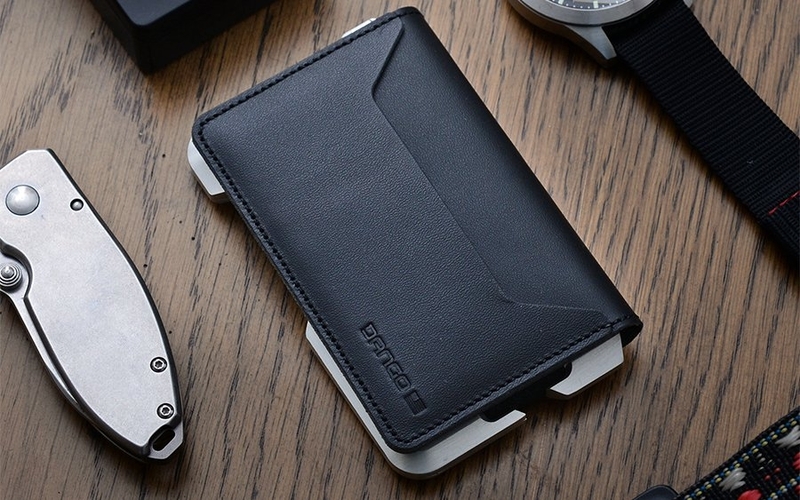 Choosing to EDC a minimalist wallet doesn't have to mean carrying fewer cards. With the right design and materials, your wallet can keep things slim while carrying everything you need it to. Dango's latest wallet, the D01 Bifold, gets the job done by combining a slim aluminum frame with a top-grain leather bifold section. The result is a luxurious yet durable high-capacity wallet that keeps a low profile bringing you the EDC-focused features you'd want for your cash and cards. The D01 Bifold starts with Dango's original D01's CNC-machined aluminum chassis as the centerpiece of the wallet. It adds structure and rigidity without much weight. New to the Bifold version is a 3-pocket top-grain leather piece that's bolted to the frame using milspec hardware. With the bifold section, the D01 ups the capacity to 12 cards across its 4 pockets. You can store 3 in the quick-access outer pocket that features thumb cutouts for easy retrieval with the push of your thumb. You can fit 3 more in the bifold section's internal pocket, 3 on the bifold's rear leather pocket, and another 3 in the internal metal cavity of the aluminum chassis itself. The metal section offers RFID protection while the externally facing pockets grant easy access and allow for contactless payment, giving you both security and convenience at the register. 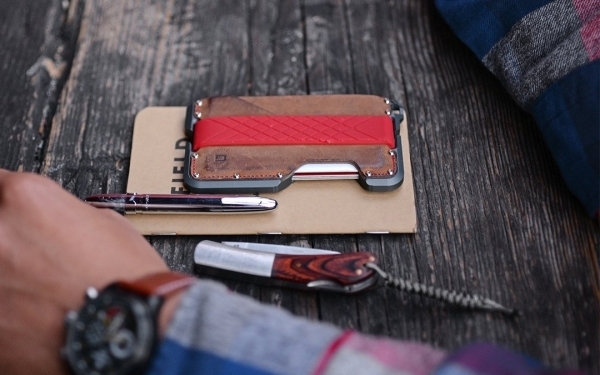 The D01 Bifold also accommodates folded cash and other overflow under its rugged silicone strap. Aside from the upped capacity, the D01 Bifold offers a slew of features you'd expect from Dango: a built-in bottle opener, compatibility with their MT02 card multi-tool, TSA-compliance, and made-in-the-USA build quality. You can choose a D01 Bifold in three color options: black and silver, brown and silver, and a military-inspired moss green leather on a slate grey frame at the link below. Green may be the color of envy, but when it comes to making gear pop, nothing makes an eye-catching statement quite like the color blue. It's the calm, soothing color of the sky, invoking stability and trust, making it the perfect color for a wallet you rely on every day. 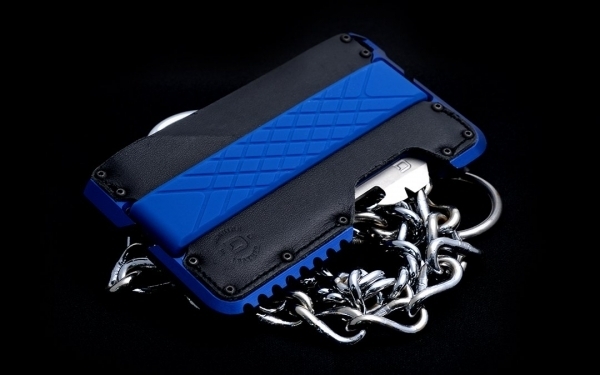 With the Blue Line Edition, Dango's T01 Tactical Wallet gets a burst of blue colorways, giving it fresh new looks while still keeping its utility-driven, reliable design. When you think “tactical,” quality and performance should always come first. The features that give the T01 its tactical badge are the same ones that make it an excellent everyday wallet. The T01's high-quality leather feels good in hand, is easy on the eyes (especially with the eye-catching blue tint), while still able to stand up to daily wear and tear. The leather is then attached to the durable aerospace aluminum frame with mil-spec bolts, giving the wallet its signature rugged aesthetic. The wallet still only weighs about 2 ounces so it won’t weigh your pockets down no matter what your activity. The T01 Blue Line Edition holds up to 12 cards and folded cash, and remains compatible with Dango's MT02 multi-tool, giving you 14 functions while easily slipping into the T01. It lets you maximize the wallet and gives you the EDC edge you need for daily tasks. Even with the MT02 inside, the wallet still only weighs 3.4 ounces and maintains a slim 0.38 inch profile. 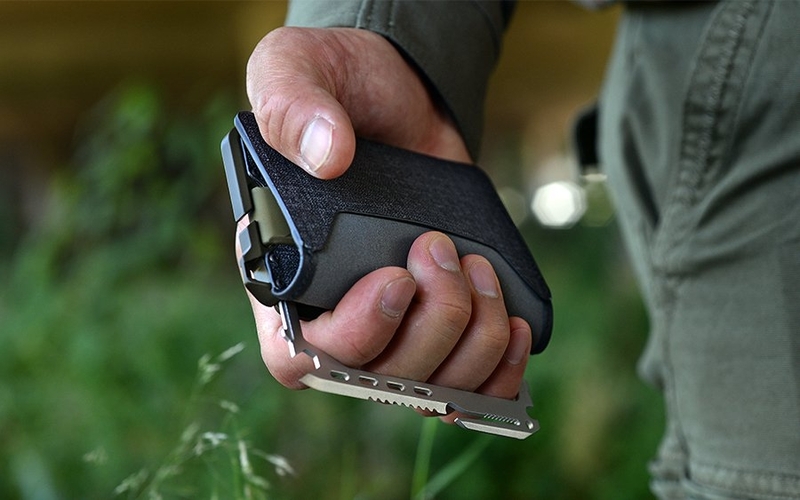 You shouldn’t rely solely on a wallet if you’re going out into wilderness, but if you need to saw, slice, pry, or open bottles in a pinch it’s a handy backup tool to have. Plus it's more than capable of handling everyday tasks around the office as well without appearing overly tactical. Each Dango wallet is made in the USA so you know they’re built to last. Whether you're doubling up on the T01 you already own or building the perfect blue loadout, check out the Dango T01 Blue Line Edition at the link below. 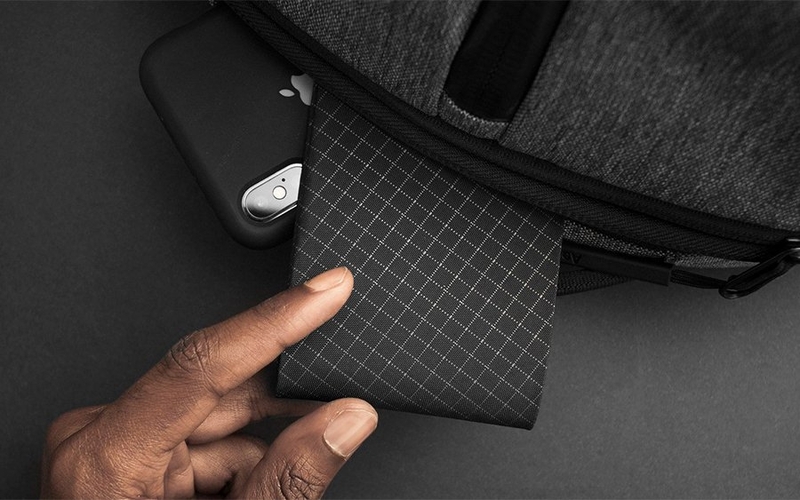 What's more minimal than a minimalist wallet? In this case, a money clip with a few tricks up its sleeve. 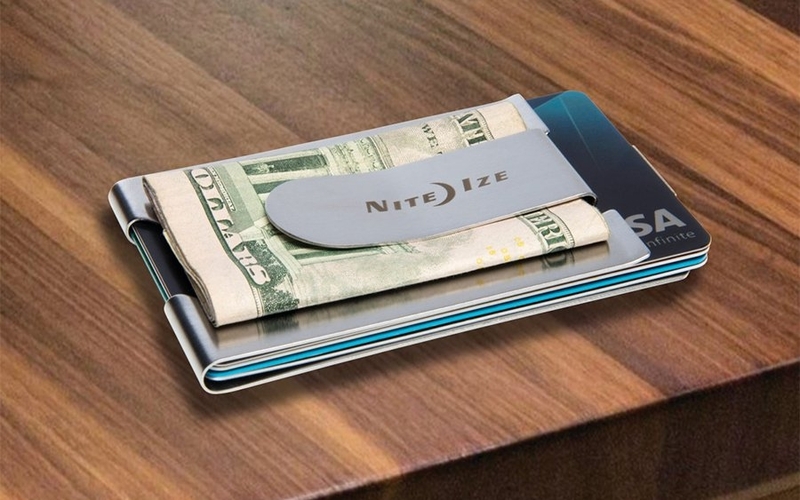 NiteIze expands their lineup of simple, practical, and affordable EDC gear with this multi-functional money clip based on their original Financial Tool. Its low-profile stainless steel body secures both cards and cash while cut-out sections shave weight and add useful tools to your daily carry. At 0.26” thin and weighing only an ounce and a half, the Financial Tool Clip is a barely there alternative to your traditional bulky wallet. Because it's made from heat-treated stainless steel as a single piece design, it's plenty durable and doesn't rely on a separate elastic cash strap that can stretch, break, or detach. The externally facing money clip locks down twice-folded cash and keeps it separate from the credit card slot, which comfortably holds about 4 cards. On the bottom of the Financial Tool Clip you have access to 5 standard-size wrenches, 5 metric wrenches, and a pair of rulers. A cut-out at the fold of the credit card section functions as a bottle opener, while angled corners double as screwdrivers in a pinch. Features and pocket-friendliness aside, the Financial Tool Clip also comes as a great value. You can snag one for your own EDC at just under $10 from Amazon at the link below. Update: Congrats to Joel F., winner of this week's giveaway! 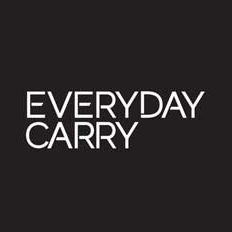 Stay tuned for more chances to win gear here on Everyday Carry. Who else loves free EDC gear? This week, we're hooking up one lucky reader with a heavy-duty tactical wallet brought to you by our sponsor, Dango Products. The San Francisco-based company are best known for their multi-function minimalist products, and it's your chance to win their tough T02 Titanium Tactical Wallet. It takes the popular EDC material and elevates their signature minimalist wallet blueprint, adding even more functionality and capacity with a bi-fold design. Like the rest of Dango's popular EDC-friendly wallet designs, the T02 mixes minimalist aesthetics with practical qualities like EDC multi-functionality, a high capacity, and slim design. Two things set this particular model apart. The first is the beautiful one-piece solid titanium chassis that's more durable and corrosion-resistant compared to previous models while still being incredibly lightweight. The high-quality chassis is precision CNC-machined in the United States, and built tough enough to handle all the bumps and scrapes of daily use. And because it's made out of corrosion-resistant titanium, it can stand up to the elements even outdoors in poor weather. We're running the giveaway here on the site until 12:00pm ET on Tuesday, July 31st. Make sure you're logged in, and find the full details and entry requirements by clicking on the button below. Good luck everyone, and carry on! You don't always need your gear to be “tactical” if you want it to be tough. Case in point: Dango's D01 wallet skews more towards the “dapper” look without sacrificing durability. And now you can keep a low-profile without resorting to the all-black, tactical look with the Dango D01 in Slate Grey. Originally a limited edition, Slate is here to stay, giving you another option for a rugged, minimalist EDC wallet with an anti-bling appeal. The Slate D01 starts with its CNC-machined aluminum frame, offering structure and strength without the bulk or weight. Top grain leather comprises the main storage section of the wallet for a slim profile and luxurious feel in hand. Finally, a silicone band serves as a simple and easy way to keep the wallet and any loose bills secure. And despite the compact size, it can accommodate up to 12 cards. Other useful features round out the D01, including a built-in bottle opener, RFID shielding, and a lanyard attachment point for more ways to carry. You can grab the once-limited Slate Grey D01 at a new low price at the link below. You'd think finding a solid EDC wallet would be fairly straight forward, but it often turns out to be far from the truth. A good wallet doesn't just hold your cards — it should organize them, protect them, and make them convenient to use and access. Nodus checks all those boxes with their line-up of EDC wallets while also adding handy features like cash-, coin-, and key pockets. Their newest bifold, the Lofold, brings all of that functionality to a more compact footprint, making it the perfect fit for shorter currencies like US or Canadian dollars. All this, plus a gorgeous veg-tan leather build makes the Lofold a strong contender for your next wallet. The Nodus Lofold might just be your all-in-one solution for carrying the essential cards, IDs, and cash you need on a daily basis. It has enough space to carry 11 cards with plenty of organization depending on how and when you need to use your cards. Frequently used cards like your ID, debit, and credit card get their own space thanks to three easy access card slots. For the rest of your cards you need with you, there's a stash pocket on the inside of the billfold section to keep them all in one spot. The Lofold keeps those cards secure from fraudsters with its built-in RFID shielding. 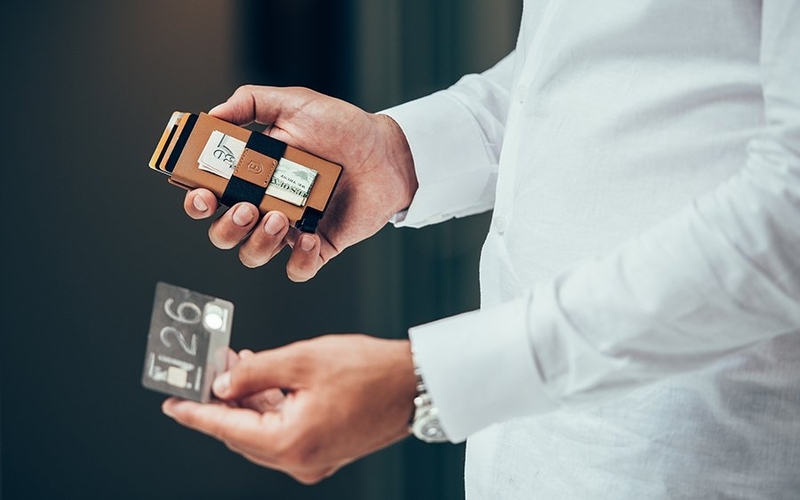 But its innovative design also lets you leave a single card unshielded so you can use it for contactless payments or building entry when needed. Carrying cash is super simple too, as the billfold section is designed to accommodate cash without needing to fold it beforehand. There's even a dedicated slot for your house key, helping you further consolidate your carry. But beyond the practicality, you'll also appreciate the premium feel of the supple, vegetable-tanned Italian leather on the Lofold wallet. It's available in three different colors, from chestnut brown, ebony black, and dark teal, so you can pick the shade that fits your personal style The Nodus Lofold's compelling mix of EDC-friendly features and smart looks set it apart as superior compared to other bifold wallets. Find out more about the Nodus Lofold wallet at the link below.